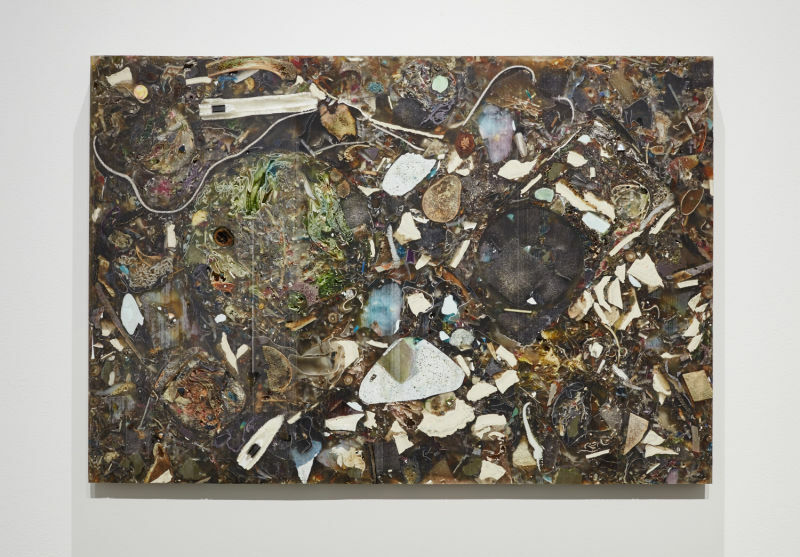 The Oakland Museum of California's current mash-up exhibit called "Unearthed: Found + Made" explores the art inherent in geology -- or is it the other way around? Together in one room, artificial rocks made by a cutting-edge artist hang out with naturally sculpted stones that were selected following the principles of an ancient traditional art form. 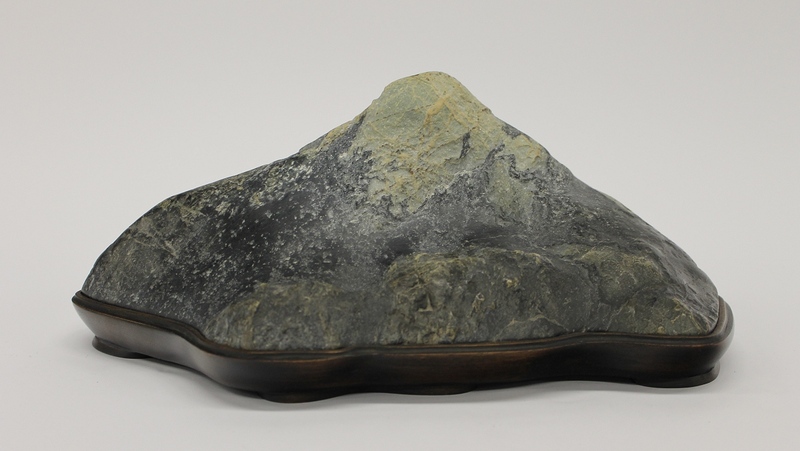 The traditional art, based on natural rocks, is called suiseki. It's a practice akin to bonsai, imported from Japan. Where the bonsai artist cultivates miniaturized trees, the practitioner of suiseki ("water stone" in Japanese) selects naturally shaped stones that suggest a landscape. The effect in the viewer is a sublime sense of the large and universal embodied in the small and individual. 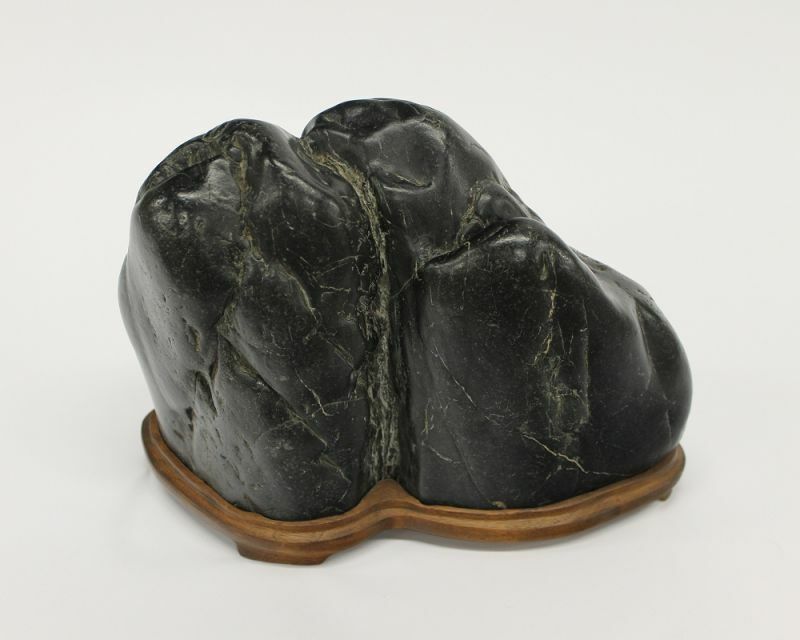 Paired with these natural stones are works by Jedediah Caesar. Caesar creates art from found objects that he immerses in resin and then uses as the raw material for sculptures, wall hangings and other forms. Cut in slices and hung on the gallery wall, this composite material resembles the polished stone of a futuristic building. It's beautiful in a Mad Max way, as if someone who only read about rocks decided to make some. Suiseki dates back more than 1,000 years in Japan and less than a century in California, but our state has recently become a hotbed of activity. "Unearthed," running through April 24, is the museum's first show of this material, contributed by members of the California Suiseki Society and San Francisco Suiseki Kai. Like people, stones acquire character from experience. This geological analogy with living things is part of what makes suiseki tantalizing. Practicing suiseki is not so much creation as it is curation or recognition, as if one were to collect the figures we see in clouds. Nature is the sculptor and the stones are portraits -- but we decide what they're portraits of. 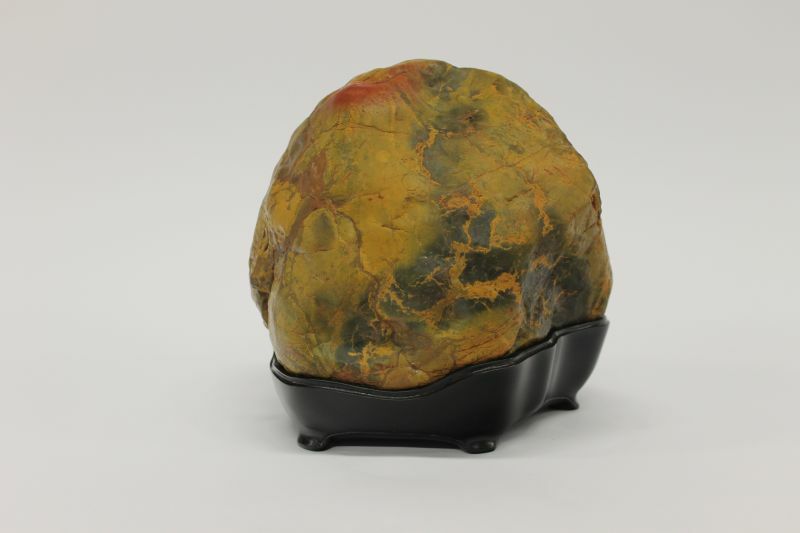 The art of suiseki consists in collecting the right stones, gently adding a hand-rubbed patina to their surfaces, and mounting them for display on a custom-carved wooden stand. They gleam in the museum's lighting like petrified Rembrandts. Because I write a lot about rocks, including suiseki, I was asked to be a consultant for this show. The task I undertook was to examine each stone, as if I were a geologist in the field, and describe it in terms of its rock type. This was so the museum could put the right word on the specimen's label, the way the Mona Lisa is decribed as "oil on poplar." Not allowed to chip, scratch or even touch the suiseki, I did my best. Truth be told, lots of rocks are impossible to pigeonhole. Unlike the names we give the different species of living things, the names geologists assign to rocks are arbitrary labels imposed upon a continuum. Most suiseki seem to be metamorphic rocks -- rocks that started out as sediment or as lava, then were transmogrified by heat and pressure and underground fluids. California's best specimens come from the Franciscan Complex, the Sierra Foothills and the Mojave Desert. Here the rocks have undergone metamorphism, giving them complex internal structure. After that, they are carved by wind, rain and rivers. One very common feature of our suiseki stones is that they've been gently broken into sharp pieces, like a cracker in your fingers, and then healed. Geologists call this process brecciation and name the resulting rock breccia (BRET-cha). That's what I did too. It was a confounding experience that heightened my usual response to suiseki. If suiseki is superimposing human ideas upon unthinking nature, what is geology? The geologist considers truth a kind of beauty, but what kind of truth is beauty? And that's just the suiseki part of the exhibit. Like water over stone, Caesar's intriguing modern experiments play off the luster and sublimity of the ancient practice. Or is it the other way around? The exhibit's opening statement keeps things simple and maybe we should too: "Extraordinary beauty can be found in the ordinary. The artworks here come from the ground."